Refashioning Thomas Hardy’s novel The Mayor of Casterbridge for the post gold rush Sierra Nevadas along with a not-so-disguised influence from Robert Altman’s snowy western classic McCabe and Mrs. Miller, Michael Winterbottom created an emotional powerhouse of a film, full of brooding drama about greed, gold and deep-rooted Catholic guilt. It’s also Winterbottom’s most beautiful film he’s shot – a classical and elegant style much different than his street realism fly-on-the-wall films such as A Might Heart or 24 Hour Party People, and on second viewing on the big screen this week at my latest Canadian Cinema in Revue screening (plug plug), it resonates as one of beautiful films of the decade (hell, yeah I said it). Sarah Polley plays a naive waif Hope Burn who comes to the town of Kingdom Come with her TB-inflicted mother Elena (Natasha Kinski) to meet a long lost ‘relative’ Daniel Dillon (Peter Mullan). But unbeknownst to her, he’s actually her real father. Dillon runs the town like a king and hordes a stash of gold in his bank. Flashbacks recounts and reveals how Dillon’s sold his wife and baby for the deed to the land and thus his ticket to wealth. So much wealth and nothing to spend it on, but when he meets Hope for the first time, instantly a wave of guilt fuels a new zest for life and need for redemption. At the same time, an ambitious young railroad engineer Dalglish (Wes Bentley) comes into town to survey the surrounding lands, which will ultimate cause the town to move thus nullifying everything Dillon built up in his life. Winterbottom doubles Alberta’s Rockies for California’s Sierra Nevadas to magnificent effect. In every exterior frame he maximizes the awesomeness of the engulfing mountains, sharp darting evergreen trees which dot the background and the omnipresent snow which gusts around constantly. Remember, it was the year 2000 and CGI was a rarity, so everything in the film is real. Though CGI is able to come very close to achieving the real thing, our minds can sense fakery. And so in The Claim, when we see a young Dillon and Elena climb a mountain in a blustery snow storm the realism on the screen allows the emotions of these scenes to hit us harder. Winterbottom crafts a number of astounding set pieces which remind us of the grandiose aspirations of David Lean, Sergio Leone and Werner Herzog. 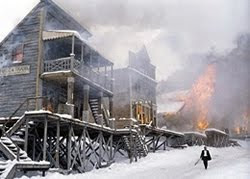 The finale, which has Dillon setting all the buildings of his town on fire is a sight to behold, not because Winterbottom actually burned down his entire set, but because it compliments Dillon’s emotional state and completes the atonement for his egregious sins against his family. There’s also the house moving scene, wherein Dillon, at his most ambitious like Herzog’s Fitzcarraldo, wills the impossible into being, steering a team of men who literally pull his house to Elena as a gift of his rekindled love. It’s also an impossible romantic moment which seals Dillon’s last courtship of his ex-wife. And the three of four surveying scenes taking us into the Albertan and Colorado valleys of where Dalglish charts the new path of the railroad, are no less spectacular. The last of which features a trip on a vintage 19th century railroad through a curving corridor of stunning beauty. The Claim resonates beyond the mere beauty of what’s put on the screen. Michael Nyman’s masterpiece of a score send the film into the stratosphere, going way over the top in the tradition of the classic Morricone scores composed for Sergio Leone. The moral complexities of Dillon’s journey is the stuff of great storytelling – though credit is due here to Thomas Hardy, Winterbottom’s brings it all to bear with a power only great filmmakers could do. The pulse of the film beats all the way to the final frames. The last shot, a stunner, sums up the all consuming power of wealth which so easily corrupts the feeble minds of men. In a new era of epic filmmaking where elements like snow, fire, background actors are ‘enhanced’ with computers, The Claim feels like a throwback epic, and perhaps the last of its kind.